Death Rate Surprisingly Low In Workers Exposed To Sept. 11 Dust : Shots - Health News People exposed to the cloud of contaminants that engulfed Lower Manhattan after the Sept. 11 attacks were less likely to die than people who weren't exposed, according to a new study. But other research found a small boost in cancer rates among first responders, as well as elevated depression and PTSD. 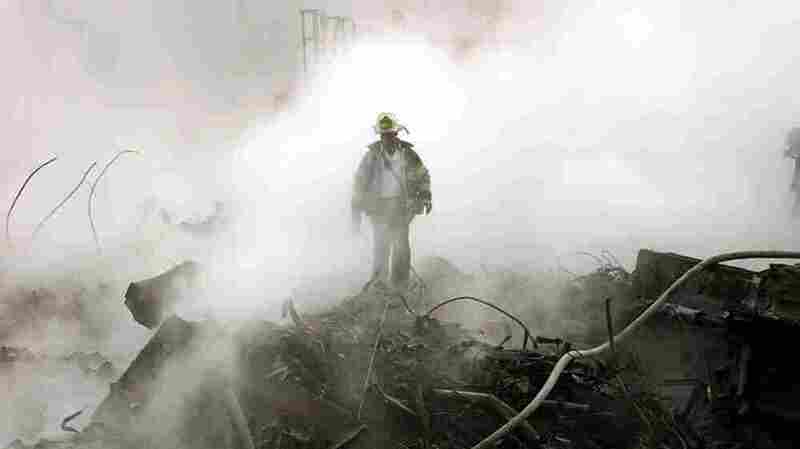 A fireman walks amongst the rubble and the smoldering wreckage of the World Trade Center in New York in the wake of the Sept. 11, 2001, attacks. Rescue and recovery workers who toiled in the dust, smoke and fumes that engulfed Lower Manhattan after Sept. 11 were less likely to have died since the terrorist attacks of 2001 than colleagues who weren't exposed, according to new research. That also holds true for people who were exposed because they lived or worked in the area. That surprising news comes from the World Trace Conference Health Registry, a huge effort to track how the health of rescue and recovery workers and residents of New York City has been affected by the terrorist attack. But it will take more time to get a clearer sense of deaths caused by the disaster. Non-rescue workers who suffered the most exposure were more likely to have died in the past 10 years than were people who suffered light exposures. But that didn't hold true for the first responders and recovery workers. This new study was published in The Lancet. It's the first peer-reviewed study of deaths caused by exposure to the Sept. 11 site. "It is the best way we could ever counter the fear and terror of that day: with data," wrote James Feeney, associate director of trauma at Saint Francis Hospital and Medical Center in Hartford, Conn., who co-authored a commentary on the mortality study. "Terrorists rely on fear and doubt to incite terror; today, however, scientific method triumphs." But as with so much in science, the data raise more questions. The assumption has always been that the tens of thousands of people exposed to the Ground Zero contaminants, which contained carcinogens like benzene, would have more health problems in the years after Sept. 11. Other studies have found that to be true, and other articles in this same issue of The Lancet found that rescue workers at the site had persistent health problems, including depression and PTSD, and a 19 percent increase in cases of cancer. There was no increase in cases of lung cancer, which is also a surprise. So Shots called up Feeney and asked how the death rate could be lower for people who had been directly exposed to the aftermath of the attacks. "It's a real puzzle," he said. One reason could be that the people who volunteer for long-term medical studies tend to be healthier than the general population. Hannah Jordan, the lead author of the Lancet study and deputy medical director of the WTC Health Registry, told Shots that volunteers for health studies are almost always healthier than the general public. People who are employed are usually healthier, too. The 13,337 workers and 28,593 non-workers in the study all volunteered. Jordan said the "healthy volunteer" and "healthy worker" effect should diminish over time. Another reason is that the illnesses that have been most common in people exposed, such as respiratory illnesses and PTSD, take years to lead to death, if they do at all. More time will help solve some of these puzzles. The WTC Registry is designed to track the health of the people directly affected by Sept. 11 for at least 20 years, Jordan says. That should give a much clearer picture of long-term risks such as cancer and heart disease.